They did it for operational efficiencies that would translate into revenue 6 Coincidentally, Ripple rejoices! As the #JPMCoin validates their entire business model as only the 6th largest bank in the world can. Too, JPM’s entry into the internal/private permissioned psuedo #blockchainworld of operational efficiency disrupts Ripple’s competitors. 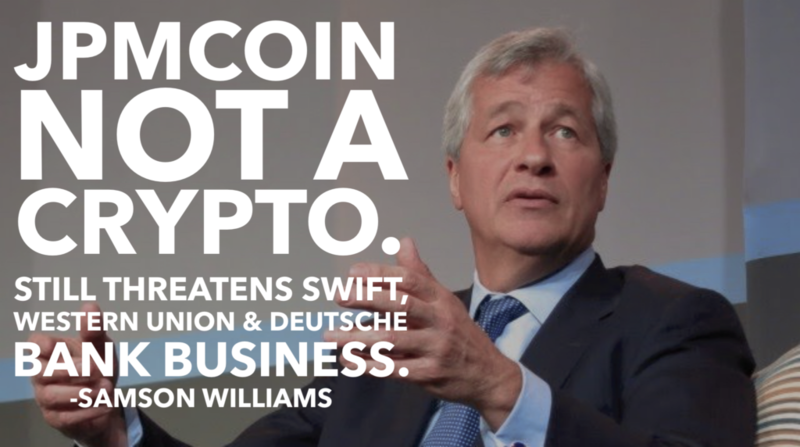 This is a blessing for Ripple, as it is easier to take down a global banking middlemen (Swift) if another global banking titan (JPMorgan) decides it wants to cannibalize its fellow banking middleman. In conclusion, if you look beyond the hype you’ll see a landscape of operations & technology innovations, with incremental process improvements that = real $$$$. Too, you’ll see an international chess board where the major players are strategically positioning their businesses to take advantage of the most efficient (profitable) and complementary services available. Stay tuned. Blockchain in finance and banking is just getting started. Next, regulatory hurdles.